​Scotland Yard has asked news broadcasters to refrain from showing live footage of special forces or police officials preparing to intercept any future terror siege in London to safeguard the lives of captives and armed officers. 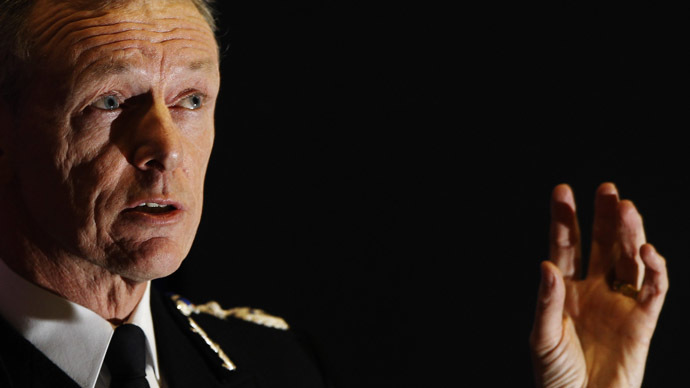 Metropolitan Police Commissioner Sir Bernard Hogan-Howe said on Thursday he was fearful that broadcasting such an event live could impede an effective police or military response. Recent terror attacks in Sydney and Paris were characterized by rolling live coverage. But counter-terror officials in Britain fear such a scenario in the UK could result in kidnappers being pre-warned about rescue operations. Scotland Yard held preliminary meetings with Britain’s largest broadcasters last week to discuss the risks entailed in broadcasting sensitive content in the wake of the Paris attacks. Speaking to the Police and Crime Committee at London’s City Hall on Thursday, Hogan-Howe said it was important the public remain informed in the event of a terror attack to ensure they are safe and protected. But he argued when the security service, police and military respond to such an event, it’s vital their efforts are not hampered by live TV coverage. In the case of the 2008 Mumbai terror attacks, live TV coverage of the situation highlighted serious issues facing Indian authorities and broadcasters. The siege consisted of 12 shootings and bomb attacks across Mumbai, which spanned four days and left 164 people dead. The architects of the coordinated attacks, who came from Pakistan, watched live coverage of the events unfolding and instructed terrorists on the ground via their mobile phones. In an official statement, Scotland Yard said the force engages in regular discussion with news broadcasters regarding police matters. “These can cover a wide range of issues, including the security of police operations where a risk to life is involved,” it said. It also confirmed “terrorist incidents and their implications for police and the media” had been broached in recent discussions with broadcasters. Chris Webb, Scotland Yard’s news chief during London’s 2005 terror attacks, told the Guardian a voluntary agreement had been brokered with leading broadcasters. When planners of the failed bomb attacks in July 2005 were cornered days later by armed police in West London, broadcasters were allowed to film but agreed not to broadcast the images live. “It is a difficult balancing act for the authorities. They have to look at how to protect life, especially if taking executive action [sending armed police or special forces in to end a siege],” Webb said. Senior news officials involved in ongoing discussions with Scotland Yard told The Guardian that broadcasters understand the need not to jeopardize police and security operations. But they stressed it’s also important that their editorial independence remains intact. Senior counter-terror officers in the UK have long maintained a terror attack in Britain is likely to occur. However, in recent years the Met’s firearms capacity has been significantly reduced. Hogan-Howe said Thursday that he was hopeful British authorities will create a reserve armed squad to address the “real and present” threat of a terrorist gun attack in Britain. The Met Police Commissioner said plans to train members of Britain’s riot squad, known as the Territorial Support Group, are under way. The government plans to deploy the squad’s services in the event of a serious terror incident.